Photo taken 28 May 2011 from http://www.flickr.com Steve Marlow. 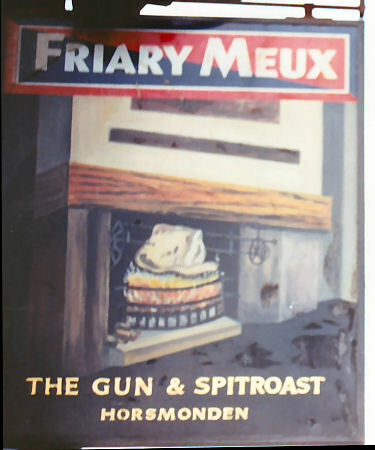 The "Gun and Spitroast" was originally the "Gun Inn," with spit-roast being a recent addition to advertise a restaurant facility at the pub. Horsmonden was once the centre of an iron industry, and the Browne family who resided there were Royal Ordnance makers. 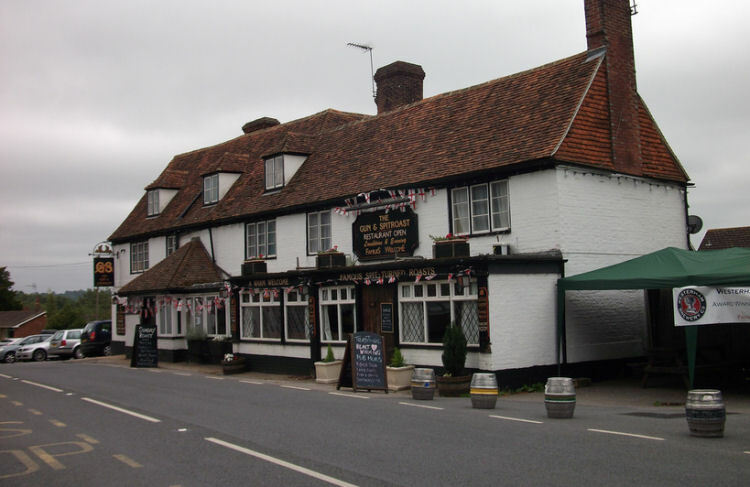 Local resident George Olmit says the following:- "The Gun was one of the many pubs in Horsemonden frequented by the hop pickers from the London East End in the 1940s. I can remembers playing outside on the green while families were spending their money that they earned during the week. The Gun and the other pubs around the green were not so "gentile" in that period but the addition of Spit roast adds a touch of class. The only roast available at that period ,were potatoes purloined from the fields and roasted in the Oast House.